Goathland tea rooms is right in the centre of the picturesque village of Goathland, and is surrounded by the un-spoiled countryside of the North Yorkshire Moors National Park. To millions of TV viewers world wide, Goathland is better known as Aidensfield, the setting for the Yorkshire Television series "Heartbeat". Set in the 1960s, the programme's blend of feel-good story lines, nostalgia, stunning scenery and vintage pop music has proved irresistible. 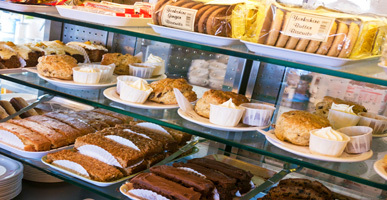 Goathland tea rooms is housed in a former doctor's surgery and the freshly prepared home made fare is just what the doctor ordered, together with a warm friendly atmosphere and service that really does come with a smile. Choose your table, then step up to the counter where a wide selection of delicious home made scones, wonderful cakes, pastries, and other home baked delicacies await you, all served with a good pot of "proppa" Yorkshire tea or speciality coffee. 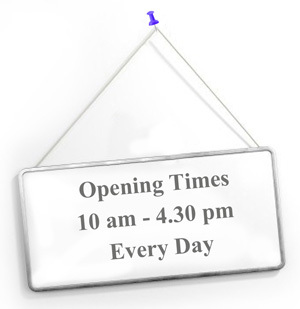 The regular menu offers a wide choice that includes soup of the day, jacket potatoes, quiches, salads and an all day breakfast, together with our famous Yorkshire cream tea. We also pride ourselves in always having vegetarian / vegan / gluten free / nut free and dairy free savoury and sweet options available. When the weather is warm, you can take advantage of our tranquil tea garden where there is lots of space, and a charming ornamental pool backed by shrubs and trees. Before you leave, be sure to visit our gift shop next door, which stocks an astonishing range of garden ornaments, gifts, and the most delicious home made fudge. 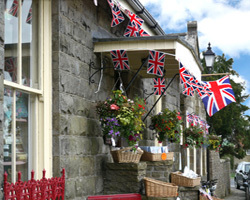 Then, as thousands of Haeartbeat fans have done, take a liesurely stroll round Aidensfield (Goathland), and see the Aidensfield Arms (Goathland Hotel), Scripps Garage and Funeral Services (Goathland Garage), and of course, the railway station, all of which have featured prominently in many episodes of Heartbeat. The steam trains of the North Yorkshire Moors Railway run almost hourly throughout the summer in both directions between Whitby and Pickering. Goathland station also featured as Hogsmeade in the Harry Potter movie, The Philosopher's Stone. If you are more energetic, you can set off to walk in almost any direction across the moors, or visit the Mallyan Spout waterfall. Several guide books and leaflets are available to suit everyone's ability. We are happy to cater for group bookings and coach parties. Please give us a call for more details. (7 miles from Whitby and 14 miles from Pickering).